Paper Mario Chapters Ranked! 7. Chapter 6: Dark Days in Flower Fields – ready for some slapstick? This chapter has by far my least favorite party member – Lakilester Michael Spike. To me, Lakilester is introduced so late in the game that I really don’t have time to grow to care about him like I do the other party members. I do like being able to ride around in his cloud though. While the Bulb-lbs are friendly, the other flowers really aren’t likable at all. And having to go back and forth between the flowers and different areas to receive the items necessary to progress in the chapter gets annoying. I guess it’s nice being so close to Toad Town but again, it’s the same thing as with Shy Guys Toy Box – you’re just right there in Toad Town. 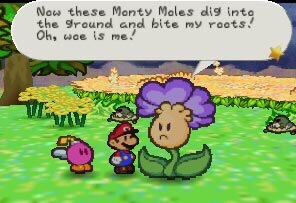 I also hate having to talk to Wise Wisterwood every time I want to leave Flower Fields. 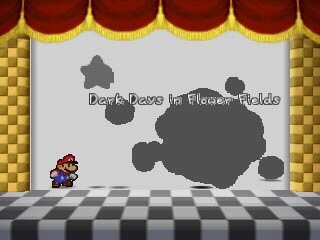 The music in Flower a Fields also lacks any kind of real energy behind it and it almost feels like the momentum the player up after beating Chapter 5 grinds to a halt.